The New York Times's GOP voter-suppression retrogame: "The Voter Suppression Trail"
Throughout the election cycle, The GOP Arcade has been releasing satirical 8-bit games about the GOP and right-wing politics in America; the New York Times commissioned a special one, based on the classic Oregon Trail, in which you play one of three voters attempting to cast a vote in either Texas (where you are a Latina nurse); Wisconsin (where you are a black salesman) or California (where you are a white programmer). If you play the PoC characters, the "game" is mostly spacebarring through a series of interactions that try to pull you away from the polling line -- your boss calls you and cancels your next three shifts for taking so long while grumbling about Trump; the school asks you to come and get your kid because she has dysentery (a nod to the original Oregon Trail) -- followed by a brief minigame where you have to avoid white supremacist "poll watchers" who are hurling abuse at you. But, of course, if you play the white programmer, you vote in less than one minute, without any frustration -- like having to return home to get a photo ID to vote at a polling place where you're already registered. On Nov. 8, a new generation of Americans will make their own heroic journeys — to the polls. Some paths will be more intrepid than others, particularly for blacks, Latinos and pretty much anyone who brings the kind of diversity to our polling places that they have historically lacked. Thanks to laws passed by Republicans to fight the nonexistent threat of voter fraud, the perils will be great. Long lines and voter ID laws, not to mention pro-Trump election observers, will try to keep these voters from the polls. 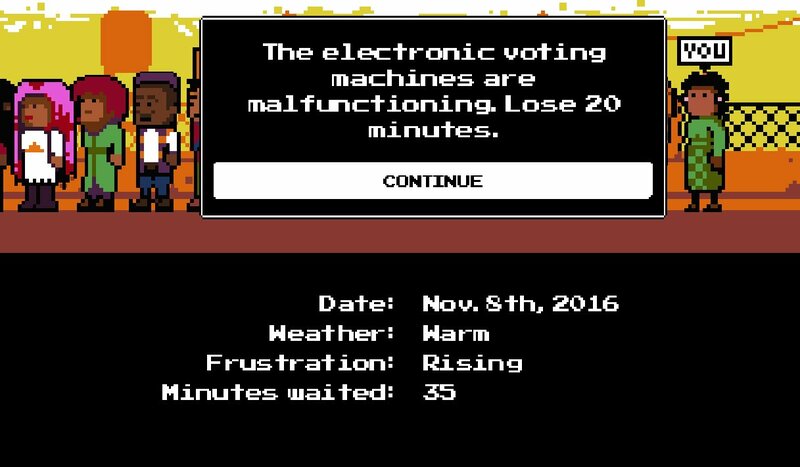 To celebrate these journeys, we’ve created a video game: “The Voter Suppression Trail.” Play as a white programmer from California, a Latina nurse from Texas, or a black salesman from Wisconsin. Experience the thrill of standing in line for hours at your understaffed polling place! Try to surmount voter ID laws! Avoid intimidation by Donald Trump’s election observers! Will you fend off the rhetoric of angry election “observers,” or heed calls from your boss and get out of line, or will you experience the fulfilling patriotic reward of casting a provisional ballot that will probably never be counted? Find out — play now!